We are an independent, international organization helping the needy of all faiths, creeds, and races. We are affiliated with the Catholic Church; however, we are not a part of the Church hierarchy. We are unpaid volunteers dedicating our time and talent to help others in need. 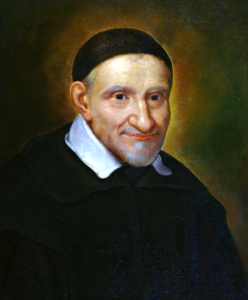 We work to fulfill the desire of St. Vincent de Paul, our patron, and the patron of the poor, to improve the human condition. We are a tax-exempt 501 (c) organization. But what do we do? Well, we help the needy by providing direct aid to those in immediate crisis. We help families through a temporary crisis by meeting short-term financial needs until the family can return to being self-sufficient. We help by assisting families improve job skills and enhance their education so they can provide for the long term success of their families. We also solicit funds from parishioners of Our Lady of the Mountains Church, from other local churches, civic groups and local agencies, foundations and charities. We screen applicants to be sure they qualify for assistance. And we have lay volunteers who are committed to improving the lives of the less fortunate of Pickens County. Our Society’s founder, Frederic Ozanam, began his charitable works in Paris in 1833. The works of the Society are today found throughout the world. Its presence in Georgia dates to 1903 with the formation of a Conference at the Shrine of the Immaculate Conception Church in Atlanta. Our Lady of the Mountains Conference began in 1997, and today our volunteers are active providing client intake and making home visits that support Pickens County families. We invite you to help us help others! Our Lord has told us clearly that the life of a Christian destined for eternity must be the life of charity, and that how we respond to the needy around us is what matters most in the end. The Society of St. Vincent de Paul (SVdP) helps us to show Christ’s love to others, and it is so easy to join. All you need is the desire to join with others for the love of God, to serve those in need. The work of SVdP is the Gospel message in action: I was hungry, I was thirsty, I was a stranger, I was naked, I was sick, I was in prison, and you cared! Come see the face of Christ in your neighbor. Christians have an obligation to serve others. This service can be done as an individual, but is often better accomplished by being a member of a worldwide Society. As a member of SVdP, you will be helping those in need through friendship and personal encounters. There are a number of ways you can help to serve others as an SVdP member. No matter how much or how little time you have, if you have the desire, we can find a way for you to help others. For more information, you can click on the link below to learn more about SVdP, and if you want to know more about our local chapter, please call 706-692-7604.